This book is an intriguing guide to being your true self. Self-love has become part of our language, especially the language of women. Self Love is visually layered with dharma art, expressing the many layers of the complex divine feminine. It offers a visual journey that is like the life of a woman�an intricate tapestry of color and beauty woven with love. The dharma art on each page presents visual, poetic, and practical offerings to guide each reader as they immerse themselves in self-love, compassion, forgiveness, and an expanded perspective. In this Aquarian Age of multi-layered communication, technology, and greater awareness, the human collective is evolving rapidly. This age is all about energy�particularly the expansive energy that is the vibration of true love flooding through our world. As the reader learns about the chakras and the aura, which is used as a container for the understanding of emotions, they will understand how subtle energy within the body can be trusted, harnessed, and utilized for well-being. Self Love provides practical ways to work with the seven main chakras and aura, the energy of the moon, the elements, the seasons, crystals, aromatherapy, mantras and mudras, and the art of making love, along with healthy plant-based recipes and cleansing and self-nurturing practices. 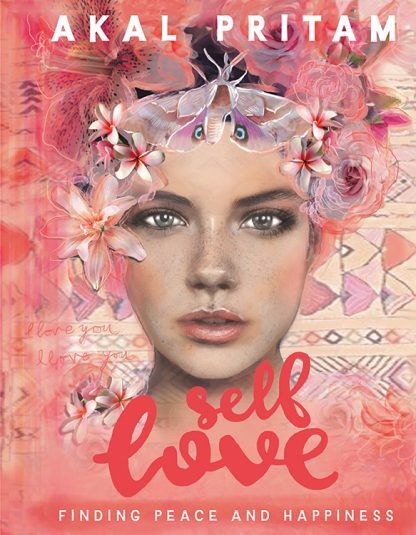 Created intuitively from the author�s own truth and experiences, the words and visual messages in Self Love speak empathetically to all, especially women, who will each return to the beauty and layers within the book and glean new understandings and guidance. Self-loving is the best way to get up to speed with light and to attract these �love� photons to embody positive change. Akal Pritam�s life as a dharma artist began in early childhood, when she displayed a natural talent for communication. Her work resonates with a diverse range of individuals and inspires them to love themselves and grow the light of their own soul.